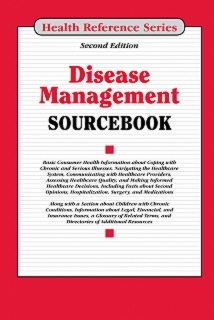 Disease Management Sourcebook, Second Edition provides facts about navigating the health care system, communicating with health care providers, finding and evaluating health information, and making health care decisions. The book concludes with a glossary of related terms and a directory of resources for additional help and information and includes access to Health Reference Series Online. Part I: Facts about Serious and Chronic Illnesses presents an overview of disease management in the United States. It includes information about risk factors for chronic disease and symptoms that may indicate serious health conditions or medical emergencies. It describes common screening and diagnostic tests and offers tips for finding support after receiving a diagnosis. Part II: Working with Healthcare Providers and the Healthcare System provides information about effective communication in a doctor’s office or hospital setting. Topics include making decisions in consultation with the doctor, second opinions, understanding medical specialties and alternative medicine, clinical trials and laboratory services. Basic information is also provided about choosing a hospital and undergoing surgery, and issues related to healthcare quality are addressed. Part III: Health Literacy and Making Informed Health Decisions discusses the skills that are essential for making knowledgeable healthcare choices. These include finding reliable and latest health information, personal health records, electronic health records, being aware of issues related to patient privacy rights, understanding informed consent, preventing medical errors, and recognizing fraud. Part IV: Prescription (Rx) and Over-the-Counter (OTC) Medications provides information about what medications do and how to use them safely. It discusses purchasing and using prescription, generic, and over-the-counter drugs. Individual chapters provide details about common drug interactions, adverse drug reactions, drug name confusion, counterfeit and misused drugs and imported drugs and safety concerns. Part V: Managing Chronic Disease offers guidelines for self-management practices, including tips for dealing with pain, stress, and depression. Infection prevention, assistive technology, home modifications, and transitional and palliative care options are explained. A chapter offering tips for caregivers of individuals with chronic disease is also included. Part VI: Children and Chronic Disease presents facts for parents and caregivers about serious illness in children, home healthcare, and the pediatric intensive care unit. It offers guidelines to help families and schools provide medical support for students with asthma, diabetes, and other chronic conditions, and it provides information about finding camps for children with special health needs. Part VII: Legal, Financial, and Insurance Issues That Impact Disease Management includes information about healthcare benefit laws, the Americans with Disabilities Act, and the Family and Medical Leave Act. It describes advance directives and discusses hospital bills and access to free or reduced-cost healthcare. It also provides guidelines for purchasing health insurance and addresses such concerns as health savings accounts, medical discount plans and cards, the insurance needs of people with known medical risk factors, and the insurance claim process. Part VIII: Additional Help and Information includes a glossary of related terms and directories of resources for information about disease management, health insurance, and financial assistance for medical treatments.